Creating a self-hosted WordPress site on your own domain isn’t hard at all, but it may be confusing for first-timers. 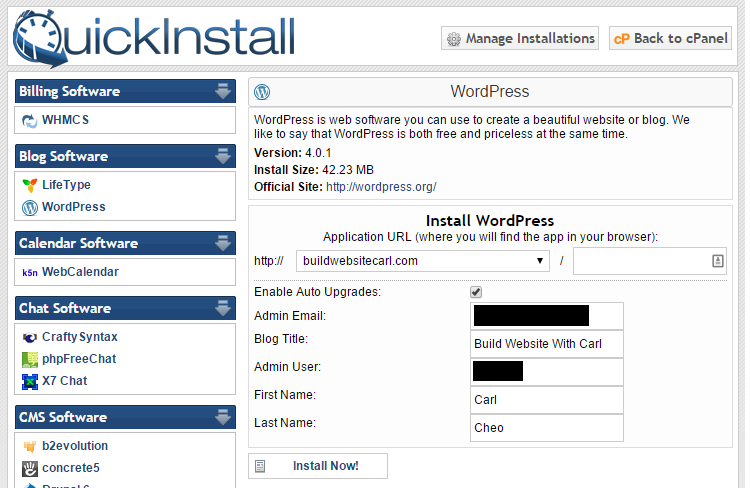 In this post, I will list down the complete steps to build a WordPress site from scratch. You can view the sample blog above at buildwebsitecarl.com, which is created from scratch when writing this tutorial, by using the exact same steps listed below. Let’s get started! 1) Go to Namecheap and enter the domain name that you want to register. Here are some great tips for choosing the right domain name. 2) If the domain name is available, add it to cart and checkout. Enter necessary contact information to complete the registration process. Hatchling Plan ($3.96/month++) – if you are planning to host one website only. Baby Plan ($6.36/month++) – if you are planning to host multiple websites in the future. Business Plan ($10.36/month++) – if you are running a business or e-commerce website that requires a toll free number or private SSL. If you aren’t going to create another site anytime soon, I recommend you to start with Hatchling plan first for any non-business or e-commerce site. You can always upgrade to Baby plan easily. Use carlcheo9off to get $9.94 off. This also works great for Hatchling/Baby plan because you only need to pay $0.01 for your first month. Use carlcheo25 to get 25% off any HostGator order. This works great for long-term hosting or any order that costs more than $25. 2) At the hosting plan order form, make sure you switch to I Already Own This Domain tab. Then, enter the domain name that you’ve just registered from Namecheap. Complete the remaining registration process. 3) Once completed, you will receive 2 emails from HostGator with login details to both billing portal and control panel. In the email with the control panel information, copy the 1st and 2nd nameserver provided. 1) Back to Namecheap. Go to your account’s home page. Under Number of domains in your account, click view. 2) Click on the domain name that you’ve just registered. 3) Select Transfer DNS to Webhost. 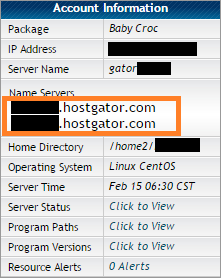 4) Now, paste the 1st and 2nd nameserver copied from the previous HostGator email into the text boxes. Press the save changes button. 1) At your Hostgator control panel, find the Software/Services section and select QuickInstall. 2) Select WordPress at the left sidebar. Click Continue. 3) Fill in the necessary information and press Install Now!. 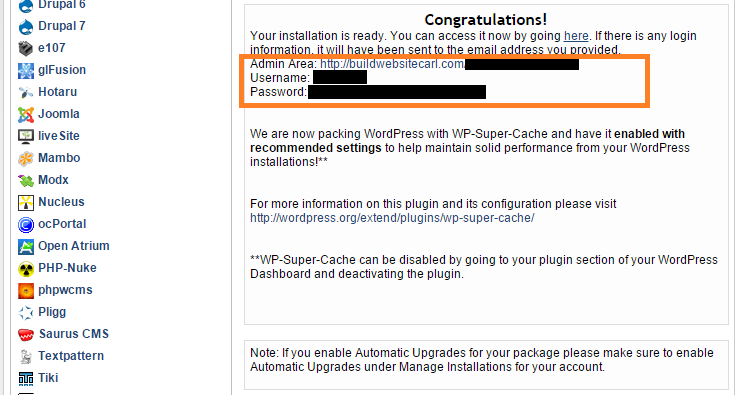 4) Once the installation is completed, a message will pop up with the login URL and details. 5) Done! You can log into your WordPress dashboard and start exploring! This freshly installed blog is using the default Twenty Fifteen theme. You can find more free WordPress themes here. ThemeForest also has a huge collection of beautiful WordPress themes that cost about $20 – $70. Do you face any difficulties during the installation process? Feel free to ask any questions at the comment section below.